It is appreciated that the greatest challenge to the applicator is the variability of the climatic conditions during the winter period. Following the guidance as below will minimise and reduce issues resulting from poor weather. During the product selection process for works that are programmed to be carried out through winter months the benefits of cement technology should be considered over that of synthetics. The versatility of the chemical set which occurs with cement binders is in comparison to the reliance of air drying and evaporation with synthetic finishes. 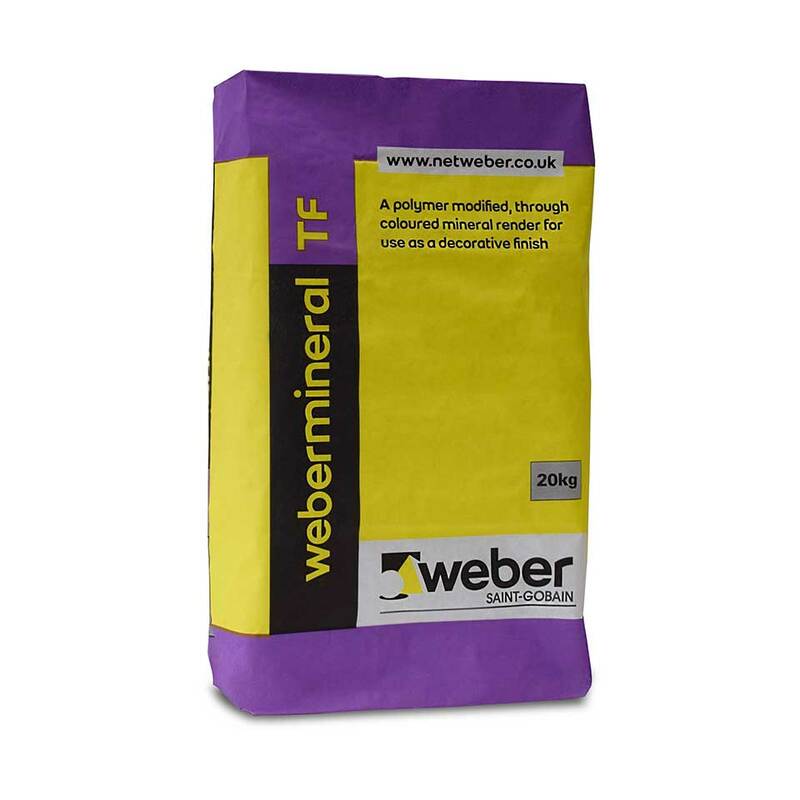 webermineral TF is a polymer-modified, through-coloured mineral render for use as a decorative finish. This product has been specifically formulated to be weather resistant, fast-setting and suitable for use for temperatures above 1°C. These characteristics allow for the product to be much more versatile in a winter application scenario. 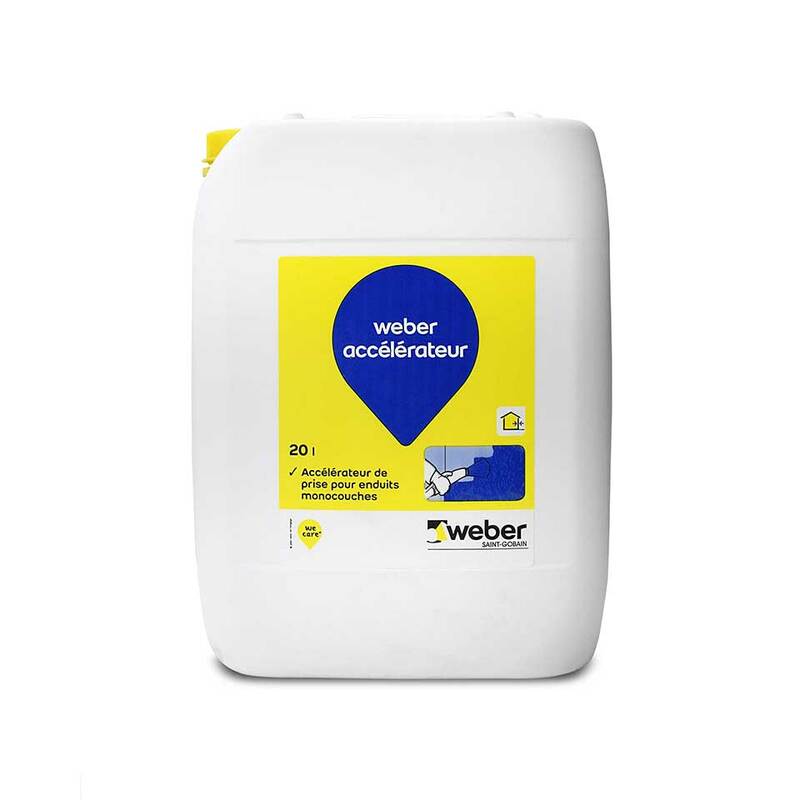 weber accelerateur monocouche is a liquid component that is used to replace a proportion of the gauging water in products weberpral M (or weberpral D) and webertherm M1. This product is not an antifreeze however it will speed up the initial set time to replicate the same setting as would be typical during summer months. If the correct dose is added it is anticipated that a 20°C scrape time will be achieved at 5°C. This will leave the products less susceptible to lime bloom. Building fabric exposed to rain and allowed to become saturated will be subject to a greater amount of movement due to drying shrinkage than one that is protected from the elements. This will put additional strain on the building envelope increasing the risk of cracking within the substrate; this will inevitably be reflected in the applied render. Protecting elevations during the construction programme has the additional benefit of helping to enable application to continue during inclement or cold weather. Do not work with frosted materials, on frosted substrates or apply any formless wet materials in temperatures below 5°C or if low temperature can be expected during the drying or curing period. If using webermineral TF temperatures should be greater than 1°C In cold weather or if frost is forecast, stop work in time or allow the material to set sufficiently to prevent frost damage. The drying conditions will vary according to wind, temperature and humidity. In frosty weather, where temperature cannot be met, work should only proceed when suitable protection is provided and the temperature is raised. Newly applied renders must be protected from damage. Artificial enclosures round scaffolding may be formed using tarpaulins, close mesh netting, polythene or other suitable material to overcome adverse weather conditions. Cement based products and synthetic products both suffer from the effects of poor weather conditions though the issues are reflected in different ways. Do not work during rainfall or if rainfall is anticipated during initial set. Do not allow rain to strike newly applied material. Absorption properties of the background are critical; if the area is left unprotected and is affected by excessive amounts of moisture this will hinder the drying and setting process of products and thus may result in a detrimental impact on bond and adhesion between interfaces and coats. When mortar mixes are subjected to damp conditions and/or low temperatures during early curing they can be affected by lime bloom. Lime bloom is a result of the intolerance of cement to significantly slowed drying conditions during its early stage of hydration. The resulting thin film of what is basically lime on the surface of the product, does not affect the integrity or strength of the material. The effect of lime bloom, also referred to as efflorescence, is initially unsightly, but will weather away naturally over a period of time providing that the elevations are exposed to the elements. Development of a white deposit on the surface of the render may occur over a wide area or be concentrated to a rain run off point. Deposits are more visible on dark coloured renders. As the render dries the excess water migrates to the surface and evaporates, leaving lime blooms. The calcium oxide then combines with carbon dioxide carbonating and forming white calcium carbonate on the surface. In addition, rainfall during application or initial stages of curing is likely to have a negative impact on the final aesthetics particularly consistency of colour and texture. Synthetic topcoat renders rely on evaporation to set. The polymer chains dispersed throughout the mixture fuse as the moisture evaporates to form a durable finish. During slow drying conditions such as low temperatures, high humidity levels and no wind the coating is vulnerable to washing off. This remains the case until the set has occurred and the finish has sufficiently hardened. Protection is imperative if work is to proceed to avoid direct rainfall hitting the elevation. Ensuring that the underlying backing render has had sufficient time to cure before work progresses will assist in the prevention of such issues. Again depending on the relative climatic and drying conditions, a period of 3 to 7 days must pass before progressing with the system finish. It remains imperative that the full system is followed including the application of the primer coat a minimum of 24 hours prior to the finish.